The Power of Teamwork | 2P START! I think we all can relate to this comic in one way or another. Teamwork in videogames is such a great idea in theory, but in practice, especially back in the 8-bit era, it was a recipe for disaster. I remember playing Mario Bros. on Atari with my brother, and all we ever did was try to get the other one killed. We would push each other into enemies, step on each other, hit the POW block just as the other was going to kill a downed enemy, etc. It was actually pretty great. We got to the point where we actually treated the game like a Mario Bros. deathmatch mode, where the whole purpose was to kill the other one. Then there were games like TMNT 3 on NES where they actually LET you damage the other players. We couldn’t go five seconds without breaking our truce. Good times. This comic was inspired by my brother and I during the days of Super Mario Bros. 3 – so hopefully there will be a lot less crying when we go through it this Christmas. Cool! We see some of Tim’s actual hair that’s hiding under the Beanie! NCG guys. But why would Tim be playing with a Doctor Pepper in his hand if it’s just Wiimote (probably sideways)? I don’t think I’ve ever seen a final panel Tim & Ray that great! I think it must be the slightly angled view rather than direct side-view. Something about Ray’s eyes too. You know, have we ever really seen him angry before? I’m not sure, do you think that last panel is wallpaper-worthy? Very funny. Not sure what else to say, but I think you could file this comic under “random” as well. And I see the calendar has returned. Also, how are you both player 1? Sorry triple post. Never mind I’m blind, the second light is lit up on one of the controllers. My attempts at being nitpicky again have failed. Finally, after many-a month of the 2P Start! cast supressing their anger towards each other, one maniacle plumber will tear their very friendship apart. With the help of Luigi and a couple of toads, the very fabric of internet life has come crashing down in a fiery duel of Wiimotes. Tim and Ray are forced to annihilate all that is known about the world as they go through the fire and flames of New Super Mario Bros. Wii. The end is nye. Co-Op Rule #7 – If you’re friend can screw you over while still reaching the goal, he WILL screw you over. Seeing videos of NSMWii online, it looks like a very competitive co-op experience. I’m going to buy it as a gift for my neighbors kids this Christmas and I won’t be surprised if fights like that breakout. First-time commenter,been tracking the comic for a few months now since I saw it back over on Joystiq.Anyway this week’s comic is the awesums.I’m pretty sure if my brothers still wanted to play videogames with me this is what would continue to encompass in our endeavors. Fantastic comic. Tried to surpress laughter in the middle of my class, but to no avail. The lack of online support in New SMB Wii is extremely dissapointing, and a missed opportunity. Oh, and real quick: Ray, I thought that you do not like a lot of blank space when designing things. Why has there been an abundance of black panels with nothing but a couple of words in them? Just something I noticed in the past few comics. I’m leaning more towards the second panel as wallpaper. It’s almost scary how much we think alike. I was gonna ask for the same thing. I like how in the last panel it looks like Tim is about to dig into Ray’s eye, and Ray looks like he is about to cry. Also, I remember everytime I played Halo co-op, at some point or another, it would turn into a who-can-melee-the-other-person-in-the-back-as-soon-as-they-respawn fest. Good times. Anyway, good luck tomorrow Tim. P.S. I like the preview post functionality you added. Wow, that comic was not only amazingly funny, but VERY well drawn (Not that previous comics haven’t been) O NOEZ RAY, why’d you take Tim’s Dr. Pepper? I think this is the first time we saw the front of Tim’s hair. And Ray’s knubby right elbow in the last panel looks incredibly weird. And seiously guys, dont leave the 360 UPRIGHT on carpet, I’m surprised you don’t have Red Ring yet. Ahh, Co-op… So innocent, yet leads to so many wars… Me and my brother always have them in the Lego games, as you can hurt the other person. It also happens a lot whenever we’re playing a NASCAR game. Anyway, nice comic! I truly enjoyed it. As for Wallpaper, I’d go with the second, just without the word Together… I don’t think it would add much out of context. actually in co-op game I usually escape the rule, I’m either the one trying to protect everyone, or being the distraction, or bait, but it’s always tempting to fight back. The comic now, really good one, second and last panel are wallpaper worthy. As for the black panel, everytime one pop-up, it can rarelly be good news for the characters, but for readers…. and also, when you’ll save the princess TOGETHER! will it turn into somekind of castlecrashers style competion or a simple YOU ARE ALL WINNERS! Just noticed the logo… I see you put a lot of work into it this week. And also, where are the wires for you 360 and Wii? I don’t see any going behind the TV… Or do you just have them wired through the wall and up to the TV? Great comic, and I agree that the second frame is the wallpaper worthy one! For some reason none of images from you guys are showing up in Google Reader. I tried resubscribing to the feed, no dice. Dunno if the problem is on their end or yours, but wanted to give you guys a heads up. Very good comic guys. I definitly want the second panel as a wallpaper. I can see the same thing happening if I play the NSMBW with my brother. just watch out Tim, Ray can kick through TVs, but I think you can rip his face off before he tries. Over nine thousand times better than last week’s (that I did not comment on because it was so bad) I love Panel 2, ‘Googly Eyes’ Tim returns along with newcomer ‘Googly eyes’ Ray! I’m betting on Tim to win the fight in the last panel, He is the more dominant male, being the first player and all, and he needs to defend his upcoming baby from any and all Koopas who might kidnap her. That second panel is great. Really good comic this week, guys. I remember playing Chip n’ Dale Rescue Rangers on the NES for over an hour and never beating the first stage until one of use had lost all of their lives and stolen all of the other’s extra lives. And it’s not like we were kids, this was University when I was 21. Ah, Ray goes for the classic “Dr. Pepper in the face” move. It’s super effective!! You fixed the television. How much was that repair bill? If the new Super Mario Bros. Wii will let you steal cards from the other player (like Super Mario Bros. 3) then I suspect we’ll both be sent to our rooms again. Press A to slit Tim’s throat! Also does anyone notice that Ray is too happy about playing with Tim. His eyes and mouth are bigger. That’s because he was already secretly scheming to throw ray down the first petey pirahna filled pipe he found. You guys should have invited Miley to play as Toad. Then again, where would she get caught in the fight? I have no idea why I even thought of that, usually when I mention Rouge there is some relevance, but this time…nope. I think somehow I connected Miley with Rouge…weird. Is that why the couch is so lumpy? P.S. That second panel is absolutely FABULOUS. This is one of the few comics that made me laugh out loud(LOLZORGS!). I think you’ll have a lot to use for your comics after the E3 anoucements, so I’m looking forward to them. I never really played the original Mario Bros. (being more of a Donkey Kong, Pac-Man, & Q*Bert fan at the time) but I had tons of enjoyment with the 2-player Mario Bros. mini game when SMB3 came out. Tim (or Ray) brought over one of their Wii remotes from home. They actually haven’t even starting playing yet and are fighting over who gets to sync them. Double post, but welcome aboard A.L. It’s great here, and the comics are hilarious, take the time to read over them all. I see you like One Piece. I like One Piece. Hehehehe. Press B to drown Ray in Dr. Pepper! I’d like the third panel as a wallpaper please. And multiple resolutions if possible, I might want to span it over dual monitors. With the second panel’s shiny background, it almost seems like they should be shouting “LANDMASTER!” instead. Also, I think Tim severely dislocated Ray’s left arm in the last panel. Although Ray’s torso seems to be twisted pretty far, so maybe he’s secretly a contortionist. Very funny comic. It brings back memories of Mario 3 with my sister. I am really looking forward to NSMBW or however its abbreviated. I’d also like to throw my weight behind getting panel 2 wallpaperized. Final Fantasy Crystal Chronicles is the ultimate game in basically making you play co-op mode. There is little to no benefit in hurting your friends. And yet, whenever I’d play that game with my brother, we’d end up fighting. Which just goes to show you….it’s always something! Wait, so who’s Mario and who’s Luigi? I never would have thought! I thought that beanie was fused to his head! Or maybe it was PART of his head! Also, Ray looks a little too happy in the second panel. It’s like he gets some kind of intense joy out of being able to play with Tim. Putting jokes similar to the ones from the ‘Ray’s Adventures In Dating’ comic aside (you know what I mean), I’m sure Ray got a kick out of FINALLY getting to use ‘The Power of Teamwork’ as a comic title. Also, this comic brought something else to my attention. When exactly did Ray get his eyebrows removed, anyway? Ever since the first comic, Tim has had eyebrows, while Ray has not. I would think it would be a little uncomfortable to shave those off, man. Plus it probably limits your range of expressions. If you look at the calender real closely on panel 3, you’ll realize it’s the day before 2p Start dies. As you know, it was suppose to die because of Tim’s baby, but I now know it has nothing to do with that. Nor does it have to do with Ray/Sonic stopping the comics to star in some good games. No, it’s because they got into an arguement about who would be Mario and who would be Luigi. Maybe D3vin and I should join in, because, as the third and fourth player, we get stuck with the toads. Ray got Dr. Pepper on Tim’s Beanie. I smell comment of the week. You do realize that nine times out of ten when people say something like that, they end up being wrong? I’m not saying this one specifically will be wrong, or saying you’re the only one that does this, but it seems like a waste of a comment to say something’s probably going to be comment of the week when it usually ends up not being that comment. Just a little pet peeve of mine. 2nd panel confirms it, Tim and Ray are gay lovers. I’m so happy for you guys for finally coming out. Maybe D3vin and I should join in, because, as the third and fourth player, we get stuck with the toads. Ray needed the Smash logo in his eyes in panel 2. That would have topped this comic off. What would have gone in Tim’s eyes in panel 2 then? Hmm…. You gotta remember though, that only happens when the subject of Brawl comes up. Maybe Mario’s head would apppear in Tim’s eyes and Luigi’s head in Ray’s? O NOES, 2P START! Dies today!!! Good luck with the baby, Tim, if it is born already. I’m sure this will actually happen to plenty of people. Ray is Player 2 (I assume). 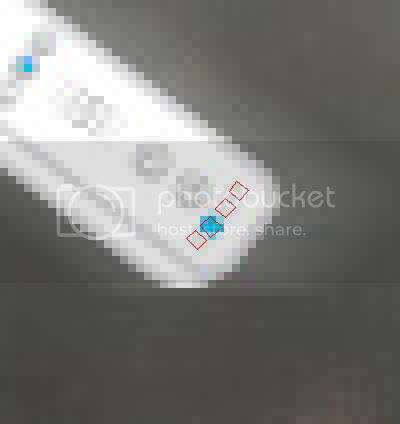 Look closely at the Wiimote in mid-air. Ray is Player 2 (I assume).Look closely at the Wiimote in mid-air. Look closely at the comment right under the one you just quoted. When there’s 60 comments on the page already, you miss a few here and there. Heh. I think the logo is red with blood, due to not only the fight, but because 2PSTART is now dead. Your web comic is pure awesome, Ive never read an entire web comics archive in one sitting and laughed at pretty much every single strip. Your sense of humor and game roots hit me exactly. I even found some of the low key or subtle humor ones to be hilarious. For example one of the earlier ones that ray was taking a break on and tim filled in. Definatly bookmarked. Cant wait for more. A dollar symbol, of corse! First off, we already know that Ray is Sonic. Therefore, since Tim is likely the final boss due to his difficulty, Ray/Sonic will go Super. We have also concluded that Ray is Tingle. So Super Ray/Sonic/Tingle will then proceed to throw bombs at Tim, thus utterly pwning him. Or maybe he just wins because he’s the artist. ‘Nuff said. Having three brothers myself I recall this. Shoving them down pits when they tried to resist, or jumping by them to power-ups in games was hilarious. I’m a mean older brother. I hope we aren’t just stuck with Toads as extra characters in NSMBW, so long as we keep Daisy out. Astoundingly good prediction. With all the friendly fire, accidental or otherwise, the co-op is actually harder than playing alone, even with free mid-level respawns. Unless you bubble-cheat. This comic fits Kirby Epic Yarn better I think. That game is way to easy to be a jerk to your partner (intentionally or not) then NSMBW. This comic captures the NSMB co-op experience perfectly. Trust me, it’s worse when you do four player….but it’s still fun.